Not long ago, an animated parody by editorial cartoonist Dan Murphy offended oil transporter Enbridge. The company tried to make Murphy’s troublesome work disappear by pumping up pressure in the Postmedia boardroom. That crude move simply ensured the cartoon enjoyed focused attention and wider distribution than if Enbridge had taken its lumps quietly or, more appropriately, answered by an act of real commitment to environmental stewardship. Instead, Enbridge demonstrated its inept approach to public relations. That incompetence is on display again this week. American regulators issued a condemnation of the company’s actions before and after the Kalamazoo River disaster in Michigan. The Alberta company’s management was compared to the Keystone Cops. Safety has always been core to our operations. Full size version of Dan Murphy’ work at The Province. More on Enbridge from In-Sights. Since Powell River has played a large part in my life, the words and song of ten-year old Ta’Kaiya Blaney from the Sliammon First Nation have special meaning to me. Enjoy this impressive young person. Ta'Kaiya Blaney, amazing little girl! Thanks for the referral Don. You're right; quite amazing. Yes she is, hope and dignity beyond her years. The likes of Harper and enbridge should take heade to such wisdom. Enbridge claimed yesterday in response to the damning report on the Kalamazoo that we shouldn't worry and we should be happy because they've got it all safer than safe now (with no reference to the other approximately 1000 pipeline “events” in the last decade or so. It is somewhat telling that after they didn't learn enough from the prior 800 or so spills enough to actually, you know, prevent the tragedy in Michigan, or at least deal with it in a less Keystone Kops manner. It appears that they have learned a teensy bit about Public Relations though, as Dan's recent cartoon has been on the Province site going onto the third day now. Or maybe being a cartoon and not a sublimely effective video it was also in the dead tree edition and they couldn't figure out how to go to everybody's house who had purchased or stolen from a coffee shop their own copy and cut it out. They say anything embarrassing that goes on the intertooobz is forever, even if taken down, but that is even truer when it is published and distributed in Hard Copy, unless we get to a “Farenheit 451” type scenario. Never mind the bad press about the oilspills — if I had shares in Enbridge, I'd be cashing in after that performance. I've taught that age of kids for 36 years and I've seen some kids with moxxy. But WOW: a great speaker AND a singer-songwriter at that age? Such a jewel. I wish Ta'Kaiya all the best in her future. I am so disgusted with our current regimes! Enbridge cares nothing of the environment, the people, the country. They should put their raises back into the cleaning up of the disaster they have made and will continue to make. What an amazing little girl. The great passion in Ta”Kaiya's songs, and her wonderful speeches. We have to fight for Ta”Kaiya, and for all our children and grandchildren. Enbridge has been nothing other than a litany of, lies, deceit and dirty tactics. The BC people have taken enough of a beating from, Gordon Campbell and his thefts, corruption, lies and deceit. Nor do we forget Harper's part, in these underhanded plots, against the BC people and our province. Enbridge had the gall, to open an office in Prince George. This angered the BC citizens even more. Enbridge hasn't cleaned up, their last 804 spills. Alberta too has a gall, pushing that filthy crap of theirs, onto BC. Seems BC is to just turn a blind eye on Alberta's pipeline spills. Alberta is also bringing over American ex war veterans. We don't know if the U.S. vets will work the tar sands, or open fire on Canadian people, who oppose the Enbridge pipeline? We know Harper was going to have, RCMP anti-terrorist squads. I doubt our Canadian military would fire upon Canadian citizens. Perhaps the U.S. war veterans, are agreeable to guard the pipelines….the Keystone and Enbridge pipelines. The Common Sense Canadian web site, has the info on that subject. 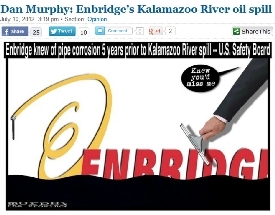 I'd believe a 5 year old prone to lying before I'd ever trust Enbridge that it will clean up its own messes!